The words evoke a certain imagery—a top notch concert hall, a large orchestra, the biggest names in Jewish Music, and raising funds for the special children of the Camp HASC summer program. The list of great moments is almost as long as the Who’s Who list of headliners: MBD and Shlomo Carlebach dancing together at the end of HASC 2, Abie Rotenberg debuting any number of special melodies composed for the occasion (“Who Am I”, “A Small Piece of Heaven”, “Candles”, etc. ), a Camp HASC camper playing “Hamalach” on the keyboard at Radio City Music Hall (HASC 7), Matisyahu blowing away the audiences at Madison Square Garden (HASC 18), the Fried(man) family dynasty singing with Diaspora Yeshiva Band (HASC 27)…I could go on and on. January 10, 2016, will be the 29th iteration of the Camp HASC concert, once again at the venue formerly known as Avery Fisher Hall (now called David Geffen Hall). 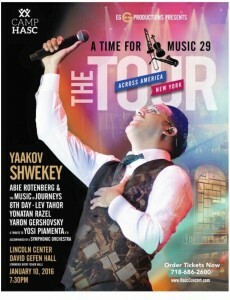 Yaakov Shwekey will headline the event, as well as Abie Rotenberg, Lev Tahor, 8th Day, Yonatan Razel, and Yaron Gershovsky. While most of these are familiar names to people who have followed these concerts closely over the years, several things have changed for this year’s event. This year, the production of A Time for Music has been entrusted to Eli Gerstner, founder and producer of the Yeshiva Boys Choir, the Chevra, and others. The other surprise twist of Camp HASC’s announcement is the fact that there will be multiple HASC concerts this year. The January concert in New York City is only the first show in what is to become a new series of events featuring Shwekey and Gerstner’s team: a dozen or more shows across America, all featuring Yaakov Shwekey and benefitting Camp HASC. While dates for subsequent shows have yet to be announced, Eli Gerstner told me that we can expect shows in cities large and small, bringing the A Time for Music experience to thousands of people who have never had the opportunity to attend a show before. Over the course of our conversation, Eli shared with me a lot of information about the production of a show (or a series of shows) of this magnitude, and I definitely learned a lot. Eli said that his focus when putting on a show like this is making sure the stage itself is impressive. While the size of the A Time for Music orchestra has varied over the course of time, Eli said that he wanted to recapture the “grandeur” and experience of the early shows, which featured 65-piece orchestras and 101-voice choirs. “Maybe not quite that big…you still need room on the stage for the video equipment and the lighting, which is an integral part of a show in 2016,” he said. “But we are definitely aiming for that full symphonic setup, which will be a part of all the tour stops”. I remarked that Eli’s typical studio production (YBC, Chevra, etc.) had a definite tilt towards electronic music, and I asked how that translated to producing a show that promised a symphonic arrangement. He told me that he actually personally prefers orchestral music, and, while his studio albums are heavy on the synthesizers to appeal to his younger audience, the HASC Concert audience skews older and shares his appreciation for real live instruments. Special thank you to Eli Gerstner for taking the time out of his busy schedule to talk with me for the purposes of this article. Tickets to A Time for Music 29 can be purchased at www.hascconcert.com and start at $100 per person. However, HASC 7 was at Radio City Music Hall (you wrote in the opening of the article that it was at Carnegie Hall. The only HASC at Carnegie Hall, was A Time for Music 19. When are the tour dates and locations coming out? Nuchie: Thank you, I knew that–that was a brain cramp on my part. It’s fixed now. Where: Eli said that the details are still being finalized, but there should be an announcement soon. Basically, he was saying that if you live in a medium-sized or bigger Jewish community in the US or Canada, you will be within driving distance of a HASC concert. i hope they do. last year they didn’t and i don’t know why. for those who can’t make it, its really meaningful ( and enjoyable) to watch on dvd. I think that Hasc 29 was amazing!! !